The Iris Stager Safe Passing Act will establish a standard safe passing distance that only applies when road conditions allow. 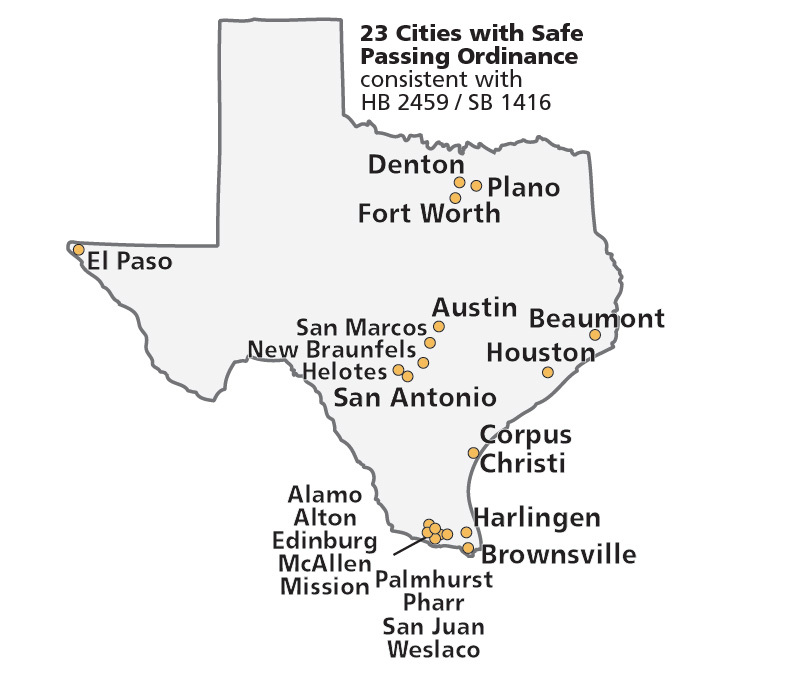 Twenty-three Texas cities have passed local laws consistent with this bill. Safe Passing applies when passing road users who are unprotected including pedestrians, runners, physically disabled persons, children, skaters, construction and maintenance workers, tow truck operators, stranded motorists, horse riders, and persons operating bicycles, motorcycles, or unprotected farm equipment. 1. What protections does this bill provide? This Safe Passing Bill will establish for unprotected road users a standard safe passing distance of 3 feet (or 6 feet for Commercial Vehicles) that only applies when road conditions allow. It also prohibits the “right hook” (turning dangerously in front of an unprotected road user) and failing to yield when making a left turn at an intersection. 2. What are the penalties for violating this bill? Up to a $200 fine under Section 542.401 General Penalty of the Texas Transportation Code. The bill establishes a violation of this law as a misdemeanor punishable by a fine of $500 if the violation results in property damage or a Class B misdemeanor if the violation results in bodily injury. 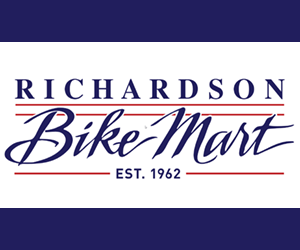 The Safe Passing Bill establishes the breaking of traffic laws by a bicyclist, or other unprotected road user, as a defense to prosecution. 3. Who are unprotected road users? Unprotected road users include a pedestrian, runner, physically disabled person, child, skater, construction or maintenance worker, tow truck operator, stranded motorist, or equestrian, as well as a person operating a bicycle, motorcycle, or unprotected farm equipment. 4. Why do we need this bill? Sadly, approximately 50 cyclists, 400 pedestrians, and 500 motorcyclists are killed every year in Texas. Many of those fatalities could be prevented if this law were enacted. 5. Why do unprotected road users require additional protection? Roadways are open for public use by law in Texas, but some users do not have the same (armor) protection as motorists. 6. How are the safety distances determined? Why 3 feet for cars and 6 feet for commercial/large trucks? The safety distances are consistent with existing safe driving practices. Currently the Texas Commercial Driver’s handbook recommends commercial vehicles allow six feet because of the wind effect of a tractor-trailer that can pull a cyclist three feet closer. 7. Have other states enacted Safe Passing laws? The following 25 states have a law protecting unprotected road users and requiring 3-foot passing clearance: Arizona, Arkansas, California, Colorado, Connecticut, Delaware, Florida, Georgia, Illinois, Kansas, Louisiana, Maine, Maryland, Minnesota, Mississippi, Nebraska, Nevada, New Hampshire, Oklahoma, Tennessee, Virginia, Utah, West Virginia and Wisconsin, plus the District of Columbia. 8. Is there a presumption of liability? No. The Safe Passing Bill has no effect on the presumption that a person is innocent until proven guilty. 9. Can a motorist pass a unprotected road user in a no passing zone? First, the Safe Passing Bill will establish a standard safe passing distance of 3 feet (or 6 feet for Commercial Vehicles) that only applies when road conditions allow. If road conditions do not allow, the Safe Passing Bill has no effect on passing in no passing zones. 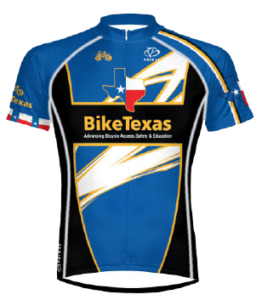 Second, current Texas law provides that a cyclist moving slower than traffic shall ride as near as practicable to the right edge of the road way and that a cyclist may not obstruct the normal flow of traffic. Current Texas law does not provide an exception to allow passing in a no passing zone. A motorist must wait until the no passing zone ends to pass another road user, including a tractor, cyclist, or other slower-moving legal road users. Texas law concerning safe passing currently requires a “safe passing distance”. The Safe Passing Bill defines a “safe passing distance” as 3 feet. See the Iris Stagner Safe Passing Act (HB 2459) on the Texas Legislature website.